I try to set aside some time every day for quiet. Call it meditation, call it focused breathing, call it relaxation. I usually just call it my quiet time. And I have been absolutely abysmal at doing it at all lately. When I tried to do it in my first trimester, I would inevitably fall asleep. Every time. Now in my second, it feels like there is always so much to be done. Even though I know I feel better when I take some time for quiet, it's a discipline and as such it takes commitment and determination to stick with it. But being one month away from my third trimester, my thoughts are starting to wander toward birth. Being able to relax in my body, having practiced relaxation nearly every day (using this CD), was so instrumental in having the unmedicated birth that I had hoped for with Indigo. I knew I had to start again. Yesterday I decided to start small with only 10 minutes. Sometimes the older kids (Evie's napping) protest a bit, but I think all in all, it's good for them to learn to respect the need for quiet. Indigo asked, like she often does, if she could sit with me. I replied, as I often do, that of course it was fine, as long as there was no talking. She agreed. I set the alarm on my phone for 10 minutes. Within two, she fell fast asleep. 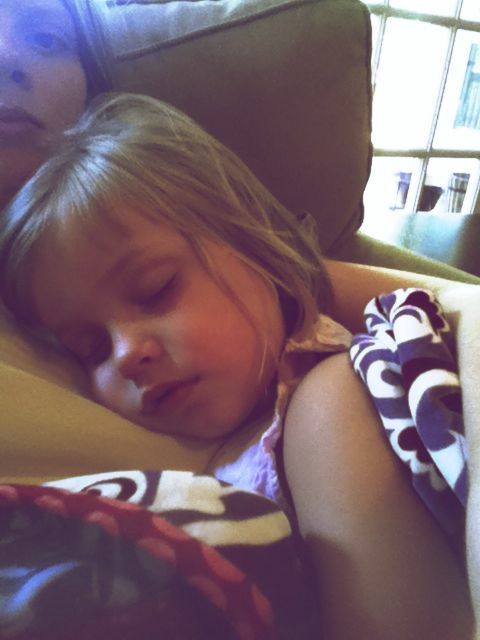 It has literally been years since she has fallen asleep on me. I had to soak it up while I could. I sat for 30 minutes. It felt really good. You deserve quiet time my friend!!! You are superwoman!!! And don't you just LOVE when they fall asleep on you! Awww! love it! PRECIOUS moments with 2 of 3 of your girls! Love it! !